The Federal Reserve’s Federal Open Market Committee (FOMC) meets this week amid further signs of improvement in the economy. No rate increase is expected, but the focus is on the central banks’ response to shrinking economic slack and fiscal policy initiatives. Pressure is also mounting for the Fed to address the management of their $4.5 trillion balance sheet. Core durable goods orders posted strong 0.8% growth in December and inventories were flat, suggesting better growth ahead. The advance report on capital goods provides some useful clues about the future. Orders for factory goods tell us something about future production, output, profits, and employment. 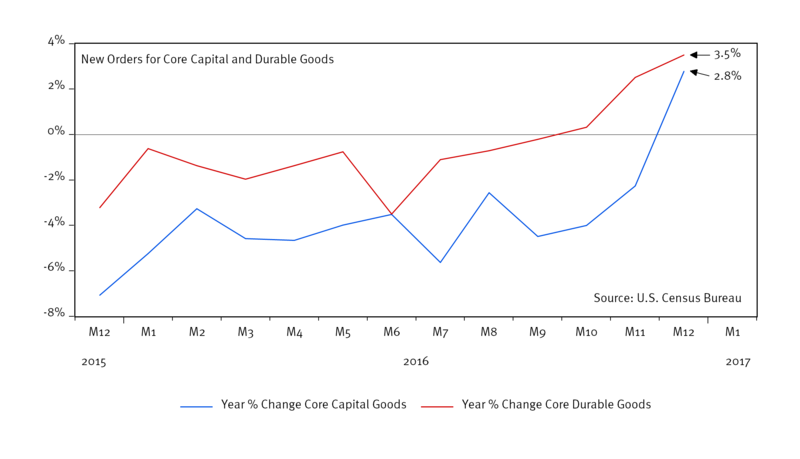 Costly durable and capital goods orders provide a good barometer for business investment. The more comprehensive factory orders report typically dovetails with the durable goods report. We focus on “core” orders, which strip out volatile aircraft and military components. As the graph below shows, there has been a sharp pickup in orders since mid-summer. The improvement implications here for investment, profitability, productivity, and employment are all positive. A year ago, capital goods orders were down 5% year-over-year and today are up nearly 3%. These purchases include everything from machine tools to blast furnaces to robots. Thus, we can say that businesses are growing more confident about future growth. Profits link into this picture too. As business investment picks up, the spending tends to return to business in the form of profits. A year ago, forecasted 12-month profits for the S&P 500 were near $123 per share. Twelve months later forecasted S&P 500 operating profits are up 9% to $133 per share. 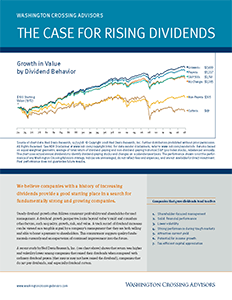 The improvement in global conditions fed into confidence, investment, and profits. Consequently, the tone in financial markets is also much improved. Last week’s durable goods report provides additional evidence that economic growth remains positive and suggests a lower probability of recession over our near-term forecast horizon. Secondary implications are positives for near-term employment, profit, and productivity forecasts. 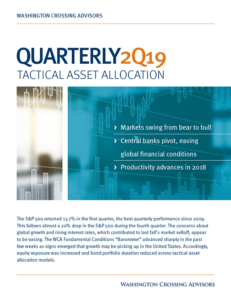 We remain tactically overweight equities versus bonds; credit over long-term Treasuries; domestic over foreign; and developed over emerging markets. Our WCA Fundamental Conditions Barometer is currently forecast to remain above 50 over the next 1-2 months.